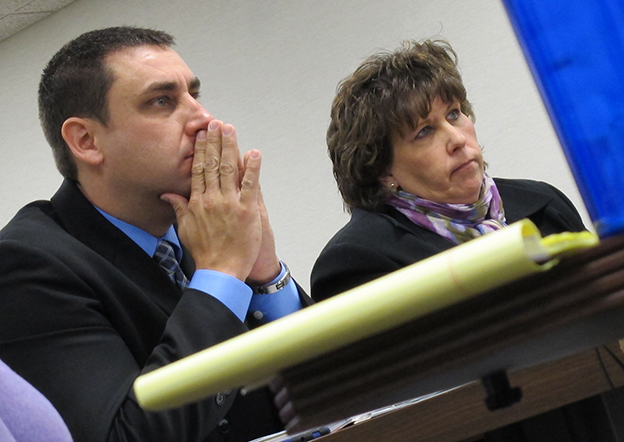 Chad Blacklock (left), director of business for the Franklin Township Community Schools, discusses the district's financial situation — and its request for state help to get out of its financial bind — during a hearing of the Distressed Unit Appeals Board. Superintendent Flora Reichanadter (right) also presented. Officials at Franklin Township Community Schools know pain. They lost $16 million in property tax revenue last year and voters rejected two ballot measures officials said would’ve closed the budget gap. They then created controversy by levying steep busing fees that ultimately got them hit with a lawsuit from a parent. Legislative action last session finally gave Franklin Township officials some relief, allowing them to restructure the district’s debt — that is, in exchange for facing tough questions from a state panel Thursday about their plan to get back on their feet. But to those on the panel, it was clear that the deep-dive discussion of Franklin Township’s finances was just the beginning of the district’s return to solid financial footing. Is Indiana’s Right To Work Bill An Education Issue? “From what I see, the pain is not over” for Franklin Township, Indiana state examiner Bruce Hartman said during the hearing of the Distressed Unit Assistance Board. The panel, known also as DUAB, was reconstituted this year to hear appeals for help of financially-troubled school districts and local governments. The board helps the districts get their finances in order with the aid of debt restructuring plans or rainy day fund loans from the state. Of these three, no district was hit harder than Franklin Township by the property tax caps. District officials say the state’s assistance has provided some relief, but they acknowledge there’s more work to do. “Property tax caps are here to stay, so we’ve got to make sure we have a plan to make our debt payments and to fund transportation and do the necessary maintenance on our buildings,” Franklin Township director of business Chad Blacklock told StateImpact. “We’re literally looking out 15 to 20 years” in budget projections. 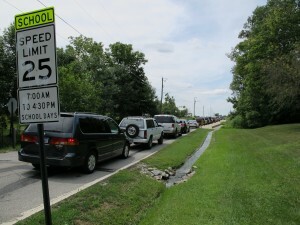 The traffic jams caused by busing fees in Franklin Township schools in August 2011. State budget director Adam Horst, who chaired the DUAB panel Thursday, offered frank but constructive criticism of the district’s finances. For instance, he pushed Franklin Township administrators to take a second look at health benefits, which he suggested might be trimmed down further. Horst was even more blunt during the review of Mount Vernon Community Schools’ petition, which officials presented after Franklin Township. There’s fear among Indiana school district administrators that the three districts before DUAB Thursday represent “the leading edge of those districts most severely impacted” by the property tax caps, as John Ellis, executive director of the Indiana Association for Public School Superintendents, told StateImpact last year. Ellis said when the idea of a property tax cap was first making its way through the legislature, even the most anti-tax lawmakers were leery of it. There’s a new dynamic at work, which is that taxpayers have a seat at the table. In the past, property taxes could be raised — not totally unchecked, but to a large extent — almost unchecked because of whatever the desires were of folks to spend money. Now it’s been reversed, it’s put on its head. Now the first question is what can the general public and the taxpayers afford to pay. And then government needs to find its way to operate within that. There are relief mechanisms and valves for folks to operate outside of the caps, but the taxpayers have a say then. It’s not that all taxpayers are saying no, and referenda are being approved. But some are not, and so I think it’s a question of how compelling is the case and how well are they making their arguments, and candidly, what actions have they taken before they asked for another dollar of tax money from someone who, candidly, doesn’t have a lot of that right now.